In 2018, the Colorado Rockies were one of Major League Baseball’s most consistent teams which resulted in them reaching the postseason in consecutive years for the first time in franchise history. The Rockies fell one game short of winning the National League West for the first time in franchise history, while they were swept in the divisional round by the Milwaukee Brewers. And although that the Rockies had to deal with being booed off of their home field by the fans in Denver to end the season, this club will look to rebound in hopes of making it back to the playoffs, and potentially winning a division crown. Last year the Rockies had one of the top offenses in the National League, and as they are expected to maintain that status in 2019, their success will begin and end with third baseman Nolan Arenado. During Arenado’s tenure with the Rockies, he has emerged as the leader of the club as well as being one of the top sluggers in the N.L. In three of the last four years Arenado has led the N.L. in home runs, while he finished third for the MVP voting on the Senior Circuit. Colorado recognizes Arenado’s importance to their club as last month both sides agreed on a seven-year extension for $260 million that will keep the slugger in Rocky Mountains for years to come. Aside from Arenado, the Rockies will return three other players who hit at least 22 homers in 2018. After finishing fourth in the National League Rookie of the Year voting in 2016, shortstop Trevor Story was able to establish himself as a future cornerstone in Denver. Story also developed a reputation of being prone to the strikeout as the led the N.L. in the category in 2017 with 191. However Story is still prone to often striking out, but he can also do some damage when he connects. Last year Story went yard 37 times, while also improving his batting average from .239 in 2017 to .291. Story is only 25-years of age, and as he is still in the process of figuring it out, he could be a dark horse in the N.L. MVP race. Last year injuries took away from the effectiveness of outfielder Charlie Blackmon coming down the stretch, but he should re-emerge as on of the top play makers in the National League. Blackmon provides the Rockies with good range in center field as he can cover the gaps at the cavernous Coors Field. And Blackmon is lethal at the plate due to his ability to get hits in the gaps as well as goes yard. However if Blackmon is able to come close to matching his output in 2017 when he led the N.L. in batting average and triples, Colorado’s offense will be difficult to stop. Whereas injuries reduced the playing time of first baseman Ian Desmond in 2017, he bounced back in 2018 to be an impact player for the Rockies. At the age of 33, Desmond may no longer be the contact hitter that he once was, but he still has the potential to blast 25 homers and drive in 100 runs which will only give one of the deepest lineups in baseball even more depth. And in a move that has flown under the radar this off-season is the Rockies picking up infielder Daniel Murphy. In recent years Murphy has gone from simply being known for his work ethic to being one of the best contact hitters in the National League. Murphy is a career .299 hitter, and his ability to hit the ball consistently to the gaps is tailor made for Coors Field as he should benefit immensely from playing there, as well as being in the same lineup as Arenado and Blackmon. With 81 games each year in the thin air of Denver, it will always be difficult for the Rockies to ever be considered as a franchise that can develop pitching, but they might have themselves a stud in starting pitcher Kyle Freeland. Last year Freeland won 17 games which is the second most for a single-season in Rockies franchise history, and he did it with pitching as opposed to relying on Colorado’s high-octane offense. Freeland posted an earned run average of 2.85 as he finished fourth in the National League Cy Young Award balloting. Freeland is 25-years of age, and he is not afraid of the moment as he has quickly become someone that Rockies manager Bud Black can rely on in regards to taking the baseball every fifth day and giving his team a chance to win. Behind Freeland, the Rockies also have a pair of solid starting pitchers in German Marquez and Jon Gray, while if relief pitchers Wade Davis and Bryan Shaw can get off to a quicker start than they did last season, Colorado’s bullpen will be very difficult for opposing batters to pick up traction against. Rockies general manager Jeff Bridich spent this off-season attempting to build off of last season’s momentum, and if Colorado is able to get off to a fast start in order to keep the pressure on the Los Angeles Dodgers in the National League West, this could be the year in which they finally break through in order to win their first division title. So close, yet so far is the best way to sum up this era of Los Angeles Dodgers baseball. The Dodgers have won the National League West in each of the last six years, while they’ve participated in the World Series in each of the last two. However the Dodgers have consistently been stymied in October which includes watching an American League team celebrate winning the World Series at Chavez Ravine in each of the last two seasons. But the Dodgers continue to employ one of the deepest teams in baseball, and although that they’ve suffered frustration in the month of October, do not expect this team to crawl into a corner and sulk for the 2019 season. One of the stalwarts in recent years for the Dodgers has been starting pitcher Clayton Kershaw. Kershaw has been in the Dodgers starting rotation since 2008, and as he is the unquestioned ace of this unit, he has also become of the best hurlers in the history of a franchise that has had its fair share of quality pitching. 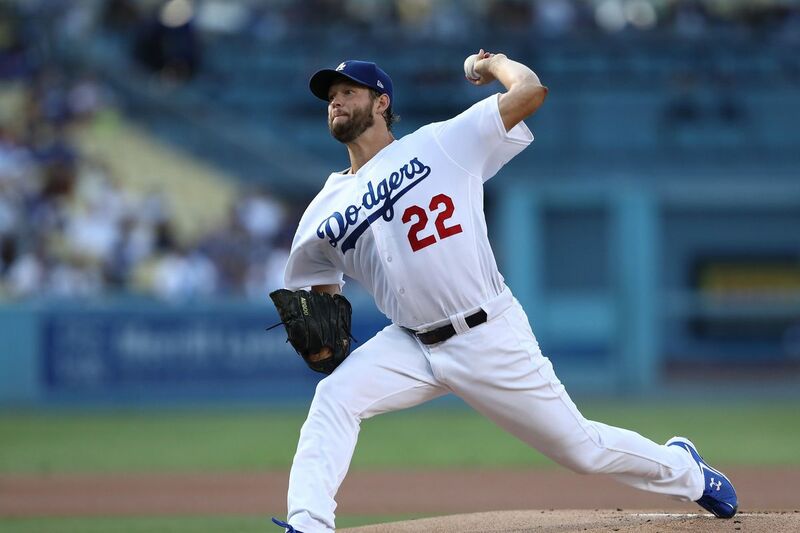 In Kershaw’s time with the Dodgers, he has won three National League Cy Young Awards, while he is just 121 strikeouts shy of passing Sandy Koufax for third place on the franchise’s all-time list in the category. But as good as Kershaw has been for the Dodgers, he enters the new season with a cloud of skepticism around him. Kershaw just celebrated his 30th birthday, and he has some mileage on his golden left arm. Kershaw has nearly 2,100 innings pitched to his credit, and in each of the last three years, he has not thrown more than 175 innings. And as a shoulder injury will limit Kershaw at the start of the season, you have to wonder if his best years are behind him. But whereas Kershaw’s star maybe beginning to fade in Los Angeles, the future is ready to shine bright for starting pitcher Walker Buehler. 2018 marked Buehler’s first full season with the Dodgers, and in 23 starts he finished with an earned run average of 2.62. Buehler would finish third in the National League Rookie of the Year voting, and he’ll look to avoid the dreaded “sophomore slump”. In just 137.1 innings pitched last season, Buehler was able to record 151 strikeouts, and his live arm is a welcome additionto a Dodgers rotation that for years has lacked depth behind Kershsaw. Like Kershaw, relief pitcher Kenley Jansen has been one of the faces of this era of Dodgers baseball. Jansen’s 268 career saves are the most in Dodgers franchise history as he is one of the best in using deception by holding the baseball in his hand until the last possible instance. But Jansen is now 31-years of age, while he in the process of recovering from a procedure to correct an irregular heartbeat. You never know how a person is going to recover from a procedure and thus the Dodgers must take a “wait and see” approach with Jansen. The depth of the Dodgers lineup allowed their team president of baseball operations Andrew Friedman to trade longtime outfielders Yasiel Puig and Matt Kemp to the Cincinnati Reds this off-season. After first baseman Cody Bellinger won the National League Rookie of the Year Award in 2017, you expected his production to slightly dip last season as pitchers now had a gauge on him in regards to what he could and could not do. But Bellinger is still one of the better sluggers in the N.L. as he has the gift to be able to cover the plate due to the length of swing. And Bellinger’s swing will be able to allow him to deposit his fair share of balls into the right field bleachers at Dodger Stadium. However one aspect of Bellinger’s offensive game to keep an eye on is his propensity to strikeout. Last season Bellinger struck out 151 times, while as a team Los Angeles was sixth in the N.L. in regards to being punched out with 1,436 as improved plate discipline will be the name of the game for him as well as his teammates in 2019. Last season Los Angeles was able to win the National League Pennant in spite of not having the services of shortstop Corey Seager for the majority of the year. Seager spent the majority of 2018 recovering from Tommy John surgery, but if healthy in 2019, he will add more depth to this Dodgers lineup. When healthy, Seager is one of the better hitters in the N.L. as he can hit for both power and average with a deadly combination for opposing pitcher’s to deal with. Seager is a solid table setter atop the Dodgers lineup as he has a career on-base percentage of .372. And if Seager is indeed healthy this season, he will in the running to be named as the N.L.’s Comeback Player of the Year. As Dave Roberts is set to embark on his fourth year as the manager of the Dodgers, he has a team that is capable to winning the National League West for a seventh consecutive year, but this squad will ultimately be judged by what they’ll do or won’t do in the month of October. Unfortunately for the sake of the San Diego Padres, they will enter the 2019 Major League Baseball season in possession of one of the longest current playoff droughts in the league. You have to go back to 2006 to find the last time that the Padres were postseason bound as only the Miami Marlins and Seattle Mariners have longer playoff droughts than them. In each of the last four years San Diego has finished no higher than fourth in the National League West which included losing 96 games last season. However for the first time in a long time there is actually some optimism in the 6-1-9 for the Padres. In recent years Padres general manager A.J. Preller has shown that he is not afraid to spend money in free agency. Last off-season the Padres signed first baseman Eric Hosmer to an eight-year deal for $144 million. However the signing of Hosmer didn’t do that much in regards to making the Padres contenders, but this time Preller executed a move that’ll trump that. All off-season long one of the biggest questions around Major League Baseball was where would infielder Manny Machado sign; and after nearly four months on the open market, he decided to make San Diego his new home. In seven-plus seasons with the Baltimore Orioles, Machado became one of the game’s best players which included making four All-Star Game appearances. Machado has also developed into Major League Baseball’s most feared sluggers as he has hit at least 33 homers in each of the last four years. However a subpar showing in the World Series last October as a member of the Los Angeles Dodgers, as well as the pursuit of a mega-deal by his agent Scott Boras did scare some teams off. But Boras and Machado would stick to their guns in regards to getting a big payday which is why the slugger is now in San Diego; however will he be up for the challenge? Although that the Padres play in a small-market, all eyes will be on Machado to deliver. San Diego brought Machado in to deliver at the plate, but to also be a leader which is something that he has not been up until this point of his career. Machado needs to develop a “first guy in, last guy out”of the clubhouse mentality as this Padres team is only going to go as far as he takes them. Machado has not shown the leadership qualities as of yet, but San Diego does have one in Hosmer. Hosmer won four Gold Glove Awards in the American League as a member of the Kansas City Royals, while also helping the franchise win the World Series in 2015. Hosmer’s strongest attributes are his leadership, glove work at first base, and ability to hit for average. But whereas the first two strengths of Hosmer were still in place last season, his ability to hit for average faltered. Last season Hosmer only batted .253 which was 27 points lower than his career average, and you have to wonder if he was “pressing” to live up to his big contract. However the presence of Machado in the Padres lineup for 2019 should make Hosmer a better hitter at the plate as he has the potential to be one of the better first basemen in the National League. Aside from the addition of Machado, San Diego is also high on the potential of outfielder Franmil Reyes and shortstop Fernando Tatis Jr. The Padres called Reyes up last season and in 261 at-bats, he hit 16 home runs. However the downside to that was the reality of Reyes striking out 80 times. But what the Padres must preach with Reyes is patience as he’s only 23-years of age, while his 6’5″, 275-pound frame makes him an imposing figure at the plate. In the case of Tatis Jr., he enters 2019 as one of Major League Baseball’s top prospects. Tatis has a strong arm which is needed to play shortstop, while he has the potential to hit for average as well as power. But as the current trend in MLB is to delay player’s service time, I expect the Padres to send Tatis to the minors to start the season, while he will more than likely be called up after June. And whereas the Padres offense should be improved in 2019, their pitching staff will hinder their chances of making the playoffs. Last year San Diego was 13th in the National League in team earned run average (4.40), and quality starts (71). Starting pitcher Joey Lucchesi and relief pitcher Craig Stammen were tied for the team lead in wins with just 8, while no Padres starting pitcher made at least 30 appearances as the team’s pitching coach Darren Balsley will have his work cut out in regards to getting quality starts out of this staff. San Diego will begin their season with a seven-game home stand as a strong showing is what they’ll need in order to really get their fan base behind them. In 2017, the Arizona Diamondbacks came out of nowhere to win 93 games en route to securing their first playoff berth in six years. But as quick as things had turned around for the Diamondbacks was as quickly as they evaporated in 2018. Things never got on track for Arizona as they never posed a real threat to the Los Angeles Dodgers for the top spot in the National League West, and when it was all said and done, they had to settle for 82 wins. But any thought in regards to the Diamondbacks contending here in 2019 will only be a pipe dream as this team decided to throw in the towel before the season even began. In eight years with the Diamondbacks, first baseman Paul Goldschmidt became one of the prolific players in franchise history. But with Goldschmidt turning 31-years of age last September as well as pending free agency for him, the Diamondbacks decided to trade him to the St. Louis Cardinals. However what Arizona’s lineup will lose with not having Goldschmidt in 2019 is a player who is a lifetime .297 hitter that has averaged 31 homers per season. The departure of Goldschmidt means that outfielder David Peralta will now become more of the focal point of the Arizona offense. Peralta is coming off of a breakout season as he belted a career-high 30 homers. Aside from the power surge, Peralta also has a career on-base percentage of .347, but will he be ready for the challenge of being “the guy” in the Diamondbacks lineup? Last year the Diamondbacks acquired outfielder Steven Souza Jr. in the hopes that he would be able to build off of his breakout season with the Tampa Bay Rays where he hit a career-high 30 homers. But injuries would derail Souza in 2018 as he only appeared in 72 games. And if the Diamondbacks are going to contend in 2019, they will need a power surge from Souza in the middle of their lineup. In three years with the Diamondbacks, starting pitcher Zack Greinke has shown the still knows how to pitch. 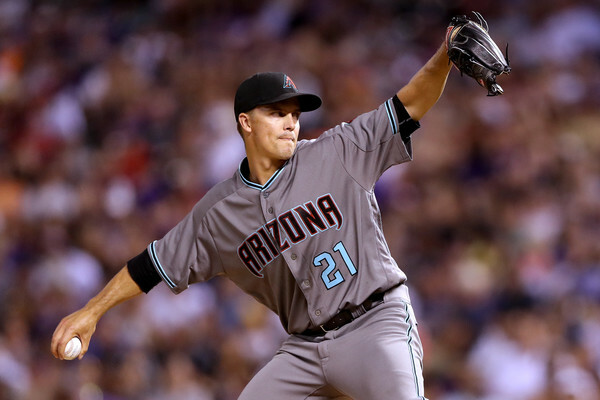 Greinke’s record with Arizona is 45-25 which includes an earned run average of 3.53. Greinke won 15 games last season for the eighth time in his career, and at the age of 35, he is focusing more on locating pitches as opposed to blowing away batters with his fastball. Greinke has always been a consummate professional as he shows up to the park to work, and his dedication to his craft is important as it can rub off on the rest of Arizona’s pitching staff. However Greinke isn’t the only Zack to be reckoned with on the Diamondbacks pitching staff as starting pitcher Zack Godley was a 15-game winner last season. But whereas Greinke does it with finesse, Godley must incorporate that into his repertoire as he benefited from a Diamondbacks offense that could score last season. Godley had an earned run average of 4.74 last season, while he also hit 12 batters and threw 17 wild pitches. And if Godley is unable to improve his control, he will struggle in 2019. Last year saw relief pitcher Greg Holland flame out as he went from being an All-Star caliber closer to an afterthought. It never worked out for Holland with either the Colorado Rockies or Washington Nationals in 2018 as he lost the confidence that led to him saving 41 games in 2017. This off-season Diamondbacks general manager Mike Hazen signed Holland to a one-year deal for $3.5 million in a move that definitely has the potential to be low-risk, high reward if the closer is able to rekindle the magic from a few years ago. In 2017, Diamondbacks manager Torey Lovullo was able to push all of the right buttons in his first year, but his team could never find that magic in 2018. However if the Diamondbacks are able to get off to a fast start here in 2019, it could be just what the doctor ordered in regards to them sticking around in the National League West Title race. After winning three World Series Championships earlier this decade, the San Francisco Giants find themselves in the midst of a transition. After finishing in the basement of the National League West in 2017, the Giants would show signs of improvement last year, but they still were not ready to get back into contention. San Francisco was attempting to speed up their rebuilding process this off-season as they were in the sweepstakes to sign outfielder Bryce Harper, but they would fall a few dollars short as he took the $330 million that the Philadelphia Phillies offered him as opposed to the $310 million that was dangled in front of him to come to the Bay Area. Aside from missing out on Harper, the Giants know that this will be the final year of Bruce Bochy’s tenure as the team’s manager. Bochy has led the Giants to three World Series Titles which is more than any other manager in the franchise’s history, and as this is set to be his last go round in San Francisco, will his team be able to surprise some people in the N.L. West? The Giants have finished each of the last two seasons with losing records and a big reason for that is starting pitcher Madison Bumgarner not being healthy. Over the last two years Bumgarner has combined to only make 38 starts which is a far cry from the player that made 34 starts for San Francisco in 2016. 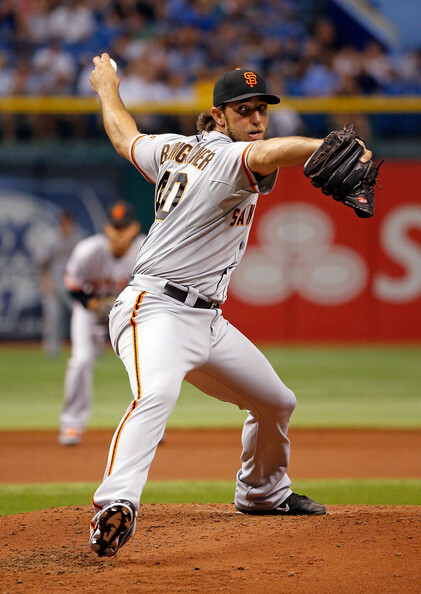 At 6’4″, 240 lbs., Bumgarner is a very imposing figure on the mound, and his swooping curve ball can make even the best hitters in baseball look foolish which is why the Giants need him to be healthy as well as on top of his game if they are going to remain in contention for 2019. The Giants were near the bottom of most offensive categories in the National League last season, and as they are set to rely on veteran players such as third baseman Evan Longoria, catcher Buster Posey, and shorstop Brandon Crawford, none of these players have the ability to carry an offense in the fashion that they did earlier in their respective careers. The transition period will continue for the Giants in 2019, and if they fall too far out of contention, I would expect their new president of baseball operation Farhan Zaidi to have himself a good old-fashioned fire sale.